Chemical logistics company Bertschi can look back on a positive 2018, having maintained its steady growth trajectory of recent years. The favourable economic climate paired with the company’s globalisation strategy enabled it to generate record turnover of CHF 960m in 2018. The current earnings situation will allow Bertschi to make substantial investments into the future development of the company in 2019. Over the past few years, the Swiss family company has made major progress in terms of the digital transformation of its business processes. Meanwhile, Jan Arnet took over as CEO of the Group in August. After recording major growth in 2017, the Bertschi Group continued this trend in 2018 with turnover rising by 8 percent to CHF 960m. As in previous years, the company’s global units achieved the highest growth figures, and now account for a third of the group’s overall turnover. The markets in Asia and South America provided the strongest momentum. Two other significant driving factors were the Chinese market and the doubling of storage and filling capacity at Bertschi’s chemicals terminal in Singapore for distribution in south-east Asia. In addition, Bertschi was able to integrate its subsidiary in São Paulo – founded the previous year – into its global network, which had a positive impact on growth of the Group in 2018. The earnings situation remained stable last year. Encouragingly, all five divisions contributed to the excellent results. In 2018, quality issues in the European rail freight transport segment had an adverse impact on the bottom line for European business. Jan Arnet succeeded Hans-Jörg Bertschi as CEO of the Bertschi Group in August 2018. “Jan Arnet’s transition to CEO of the Group was seamless, thus ensuring continuity of leadership for both our customers and our employees – it also safeguards our future as a strong, sustainable family company,” commented Hans-Jörg Bertschi, Executive Chairman. In 2018, Bertschi invested significant sums in its future, with staffing capacities expanded for software development and the digital transformation continuing apace. The development and roll-out of the TruckTracer App was a milestone for the company. With this app, which will also be used by all sub-contractors, each driver records all status messages of the transport on a central company platform using their smartphone. Real-time data is used to optimise internal transport planning, while customers benefit from visibility and more planning security in their delivery chains. The company invested heavily in the expansion of its tank/silo container fleet in 2018 and now has 34,500 units, a 9 percent increase. Major investment was also made in terminal and warehouse capacities, in particular at the group’s sites in Singapore, Antwerp and Schwarzheide (eastern Germany). The outlook for 2019 is generally positive, although a few economic uncertainties remain. “Our aim is to keep growing in 2019, which is why the Bertschi Group will be investing heavily once again in digitalisation, the container fleet and its terminal and warehouse infrastructure. Our plan is to continue to expand our presence in Asia and bolster our position in Europe,“ explained Hans-Jörg. A new transshipment centre for the import, handling and storage of plastics from overseas entered into service at the Port of Antwerp in 2018. The site will be expanded in successive stages over the next few years into a major chemical logistics terminal. 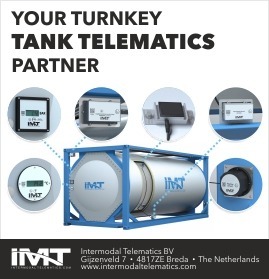 “This will enable liquid dangerous goods to be stored and distribution transport in Europe to be dispatched directly from the terminal via rail to European consumption centres. We are underlining Bertschi’s sustainable corporate strategy by shifting freight distribution from road transport to the more environmentally friendly, safer option of rail where possible,” said Jan (CEO). The family company’s globalisation and digitalisation strategy has led to a significant increase in the number of staff at the headquarters in Dürrenäsch, Switzerland, in the past few years. The workforce will be able to gradually move into an office extension over the next few weeks. In addition to modern office workstations, the new building has a canteen with a professional kitchen, cafeteria and terrace, and a specially designed recreational area in natural surroundings. „With this appealing workplace, we are aiming to attract talented people away from the major centres and thus lay the foundation for the company’s development in the future,“ explained Jan. The digital transformation will continue to be a key theme in 2019. The focus is on business processes that can be made more efficient, secure and customer-friendly through the application of digital solutions. „Digitalisation of these processes will enable us to automate repetitive tasks. Of course, employees will remain at the centre of developments as we move further into the digital age. They will be able to spend more time on personal communication with customers and partners, and on solving complex logistical challenges – there are more than enough to go around,“ said Hans-Jörg. The main focus of the traditional annual meeting of employees held on January 19 was on Jan Arnet’s summary of the business performance and Hans-Jörg Bertschi’s tribute to staff members for whom this is a milestone year. 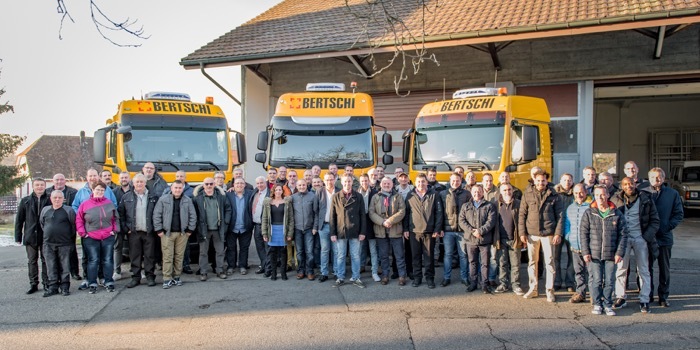 In total, 78 long-serving Bertschi employees from all over Europe convened in Dürrenäsch to be congratulated by Hans-Jörg Bertschi on their 10-, 20-, 30- or 40-year anniversary at the company. Artur Selz (Dürrenäsch), Tony Fonteyn (Antwerp), Walter Elzi (Italy), Dieter Blömer (Cologne) and Michael Burger (Ludwigshafen) were all honoured for their 30-year commitment to Bertschi, while the loudest applause of the day was reserved for Karl Müller (Hedingen), who celebrated his 40-year anniversary.